Rep. Donna Howard, D-Austin, and Sen. Rodney Ellis, D-Houston, both filed legislation on Thursday that would require personal financial statements submitted to the Texas Ethics Commission to be made available online. State Rep. Donna Howard, D-Austin, and Sen. Rodney Ellis, D-Houston, each filed legislation on Thursday that would require personal financial statements submitted to the Texas Ethics Commission to be made available online. 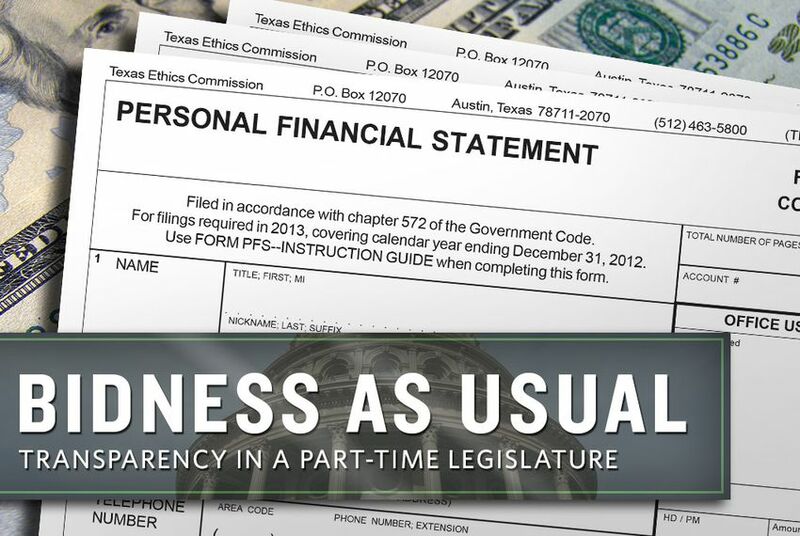 Senate Bill 417, filed by Ellis, would require the Ethics Commission to make financial disclosures available no later than 10 business days on the commission’s website. The bill would also require the commission to group these filings together by office sought and/or being held. The absence of pension information on state disclosures gained attention after Gov. Rick Perry's failed run for president. His federal financial disclosure statement noted his official retirement through the Employee Retirement System. Under current state rules, lawmakers that have retired through the ERS are not required to disclose pension collections on the state disclosures. HB 1074 also creates an interim committee to “study and review the procedures and effects of the filing of personal financial statements.” HB 1075, also filed by Howard, would provide details on the makeup of that committee. The bill would create an 11-member committee comprising five members appointed by the lieutenant governor, five by the speaker of the House and one by the presiding officer of the Texas Ethics Commission.